(Twitter)The United States Navy announced Wednesday that New England Patriots running back Eric Kettani would be released from active duty in order to continue his NFL career. 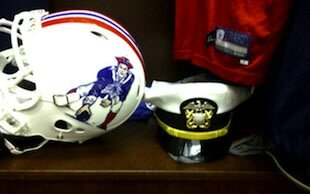 Kettani is a Naval Academy graduate who served two years of his military commitment before joining the Patriots practice squad last summer. At the time, he was given selective reserve status before being called back to service in October. "I love my country and I'm happy to serve it," Kettani said at the time, "but I'm also happy to be a New England Patriot." Kettani appealed the decision and learned of his victory this week. "God Bless America," he tweeted. The 25-year old was the second player in Navy history to rush for over 2,000 yards in a career. He was signed as an undrafted free agent by the Pats. The team has stayed loyal to him through his unsettled military status. Kettani will still owe military time after his NFL career ends, most likely in the reserves. Service academy graduates agree to a five-year commitment.